Again, when you view these forecast graphs note that you are viewing the relative rate of free fall between currencies at a particular point in time, as ALL currencies are continuously in free fall which results in the loss of real purchasing power of all currencies of which the official inflation statistics are one measurement. 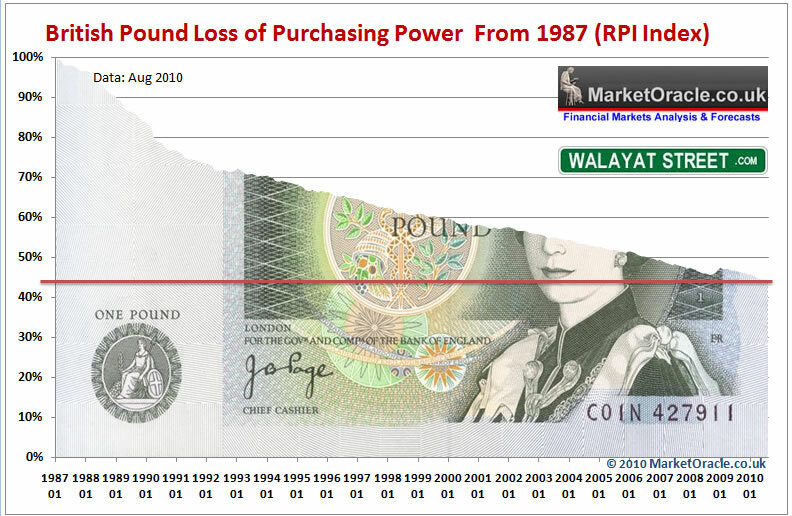 For example the British Pound in exchange rate terms is roughly where it was against the U.S. Dollar 20 years ago, however the following graph shows that sterling has lost over 40% of its purchasing power on the RPI inflation measure over the past 20 years. Nadeem, thank you for the interesting post. I agree that the EU will have no other choice than to bail out Ireland, in order to avoid a spillover of the crisis to Portugal, Spain and others. If such bailout takes place, will this be a good opportunity to invest in depressed Irish government bonds and/or even more depressed Irish bank senior debt? Too high risk to invest, trading ? perhaps but Its not something I have the time to contemplate doing as there are far too many unknown variables. I have been repatriating my money into my domestic currency as there is just too much volaitlity out there where anything could happen, especially where the PIIGS are concerned.